There are basically two ways to put a more appropriate price on carbon: carbon tax or by implementing a cap and trade system. Cap & Trade is intended to provide a mechanism to encourage emitters of large amounts of greenhouse gas (GHG) to invest in changes that will reduce their emissions. It can also provide a means to transfer some wealth and sustainability to developing nations by means such as the Clean Development Mechanism (CDM). Company 1 – Their actual emissions are less than the cap. Therefore, the amount of emissions less than the cap earns them permit credits that they can sell or trade. 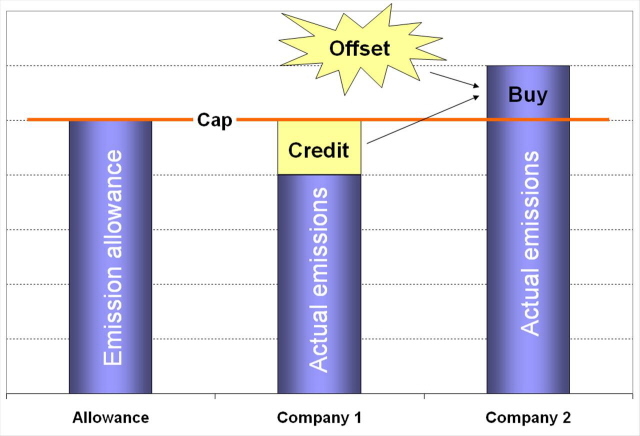 Company 2 – Their emissions are more than the cap. So, they will need to either buy regulated emitters’ credits (such as those held by Company 1) or carbon offset credits. This means they get involved in carbon trading. The only way to prevent the continued increase in global average temperatures is by reducing our greenhouse gas (GHG) emissions. The most important way to achieve this GHG reduction is directly by changing our behaviour, technology, systems, and infrastructure so that we emit less GHG every day. Carbon trading alone can’t achieve the GHG emissions reduction we need. But carbon trading could play a valuable role as long as we keep it in perspective and fit it into a much broader, more intense, and complete system. Cap & Trade has been valuable in the past. In the 1980s, it was first used in the US to reduce acid rain. After 1990, Cap & Trade got global industry to dramatically and quickly reduce the production of ozone-depleting chemicals to shrink the “hole in the ozone”. The ozone problem (See Past success above) involved a relatively limited number of companies dealing with manufacturing specific chemicals. Greenhouse gases are much more pervasive, come from many more sources, and reducing them is much more complicated. The truth is, Cap & Trade, emission offsetting, and carbon sequestration can’t achieve our goal alone. The real danger is over-reliance on any of these. If we treat them as “magic bullets” and let “them” do it for us, we will delay the emission reductions that each and every one of us must make. We need to massively reduce our greenhouse gas (GHG) emissions right now. This means it’s up to all of us to change our behaviour. Emissions caps are set by governments who are under pressure from industry who don’t want their costs increased and who fear that customers (voters) will be upset with price increases. Therefore, it is possible for a large emitter to increase their overall emissions and stay under the cap as long as their emissions per unit of production decrease.